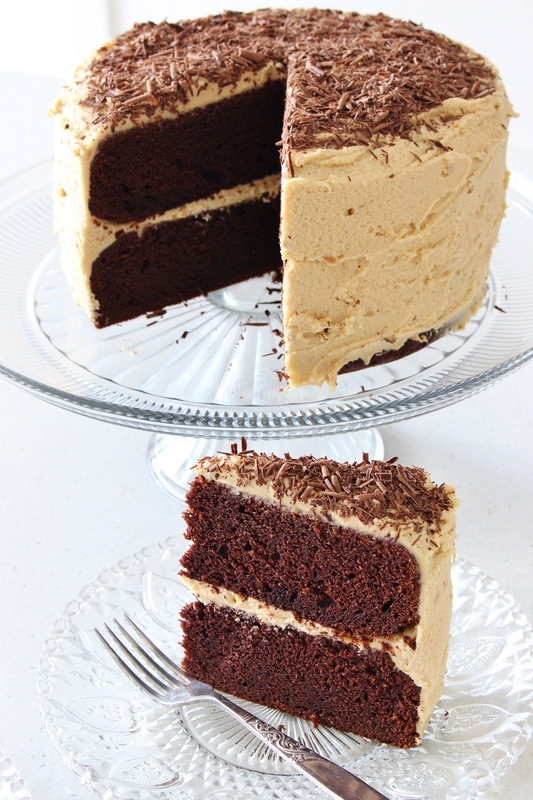 A slice of moist gluten free double-layer devil’s food chocolate cake with peanut butter frosting is hard to resist. So get ready to dig in! This year for Halloween instead of making spooky-themed treats (which I love by the way) I wanted to share with your desserts and treats influenced by my favourite childhood sweets. Hence: honeycomb, cherry ripe, and caramel popcorn. Now for the ultimate in all decadences, and a dessert influenced by our collective obsession: chocolate and peanut butter. This cake is based on a recipe that I have made many, many, many times in it’s gluten-ful incarnation. I was a little apprehensive in adapting it because, let’s be honest, sometimes things are lost in the translation from gluten-ful to gluten free. I weighed, creamed, mixed, poured, and then waiting. When the cake was cooked and cooled I levelled the tops and taste tested the scraps of cake. Perfection. Just the same bouncy, tender, moist crumb. The same cocoa intensity. Exactly as I had remembered, now friendly for us gluten free folks. We can have our cake and eat it too! Make sure your butter is softened. Bring your eggs to room temperature because they will whip better this way and give your cake the right light, airy texture. Whisk your dry ingredients together (or sift them) very well to ensure no lumps and to make sure your leavening ingredient (in this case baking soda) is evenly distributed. 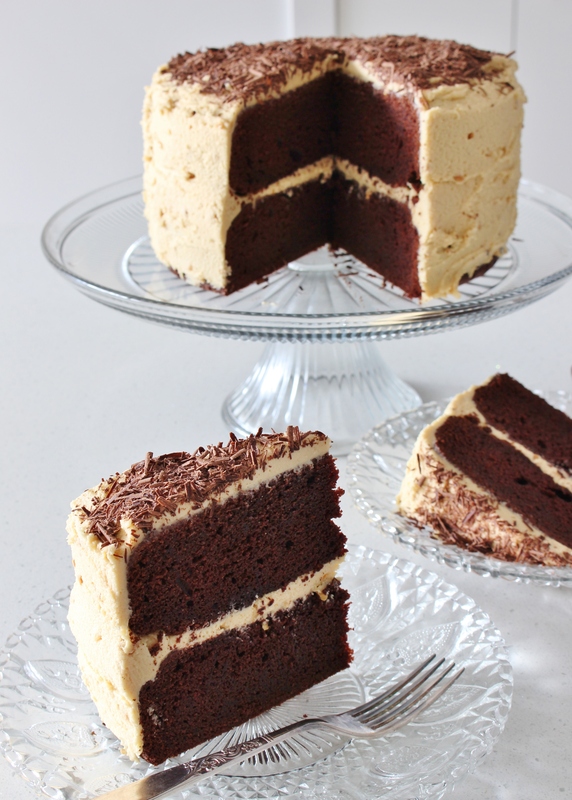 Two perfect layers of devil’s food cake are sandwiched together here with salty-sweet peanut butter frosting. Oh my Reeses. I could eat a bowl of this frosting all by itself. Who am I kidding. I probably have eaten a bowl of this frosting by itself once or twice in my baking life. 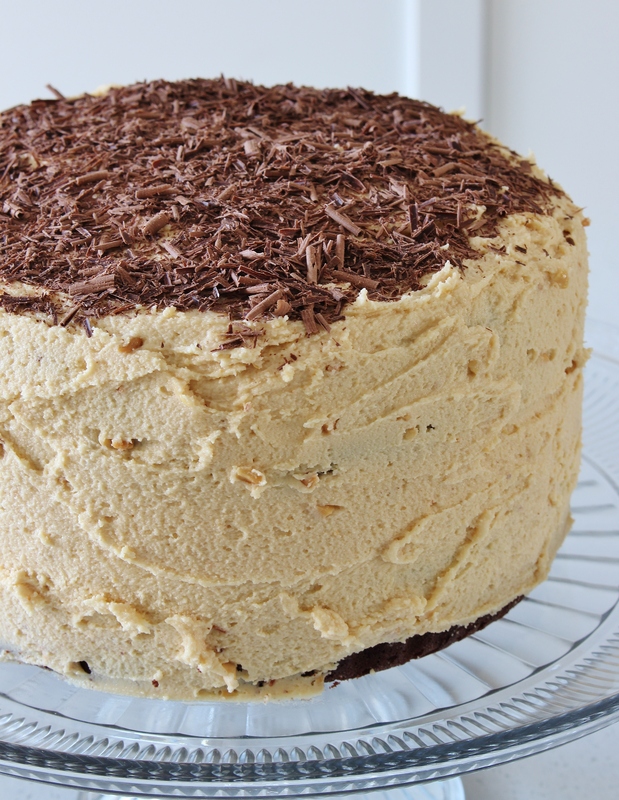 I use chunky (or super chunky when I can find it) peanut butter in this frosting because I love the texture the chunks of peanut adds to the smooth, buttery frosting. You could use smooth but you do it at your own risk. Team Chunky all the way. This cake is nothing but simple, classic, perfection layered together. 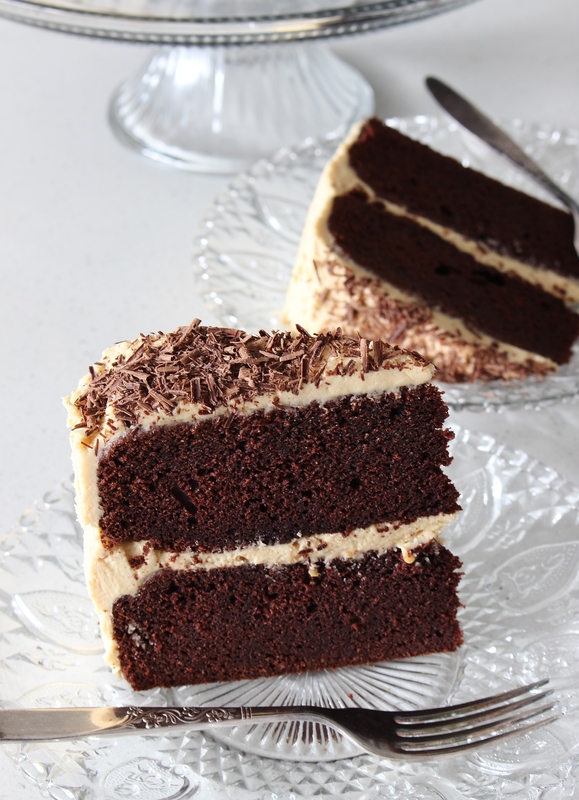 This gluten free devil’s food cake is moist, tender, and deeply chocolaty. A classic chocolate cake that is perfect for birthday, Halloween, and every cake requiring celebration in between. This is a gluten free layer cake that you can be proud of, and that I want you to have fun with. Not interested in peanut butter frosting? Firstly, who are you? Secondly, try a classic chocolate frosting, or a white chocolate frosting, or contrast the chocolate with a smooth vanilla buttercream. Take this gluten free cake and make it your own! Preheat your oven to 180C (350F) and butter and line two round 8-inch cake tins with baking powder. Set aside until required. In a medium bowl whisk together cocoa, warm water and Greek yoghurt until very smooth. In another medium mixing bowl whisk together buckwheat flour, white rice flour, brown rice flour, sorghum flour, baking soda, and salt. In the bowl of a standmixer fitted with the paddle attachment (or in a large mixing bowl using a handmixer) beat together butter and caster sugar until light and fluffy, about three minutes. Add eggs one at a time and beat until well incorporated. Scrape down the sides of the bowl between additions. Mix in vanilla. Turn your mixer to low speed and mix in flour in two parts alternating with the cocoa mixture. Beat until combined. Divide batter evenly between pans. Bake for 45-50 minutes or until the tops of the cakes spring back when lightly touched and a wooden skewer inserted into the middle comes out clean. Remove cakes from the oven and cool completely before frosting. 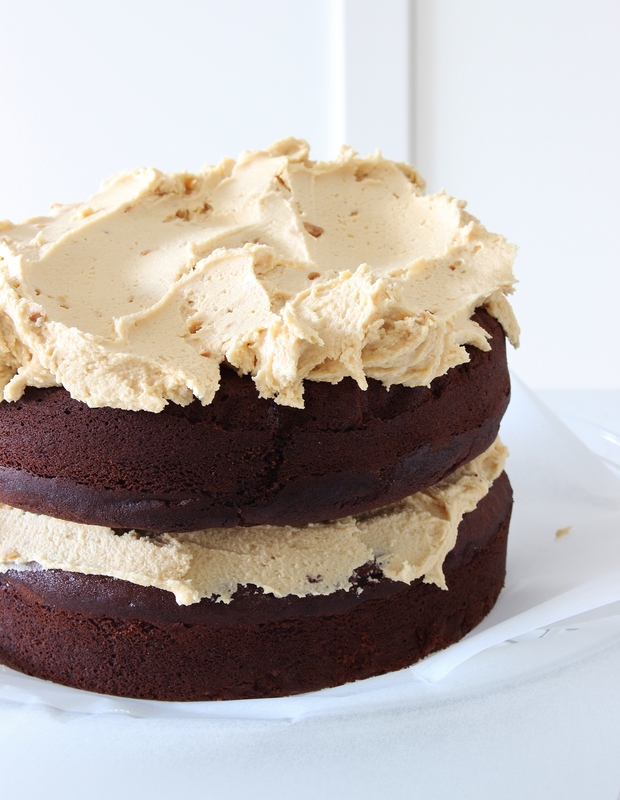 To make the frosting: beat butter and peanut butter and light and creamy. Add remaining ingredients and beat until light and fluffy, about three minutes. Trim tops of cakes so that they are flat. Place one layer on your cake plate or stand. Frost with 1/3 of the peanut butter frosting. Place other cake cut side down on top of the bottom layer and then frost the cake with remaining frosting. Sprinkle with shaved chocolate if using. Serve. If not serving refrigerate until required. Take out of the fridge 30 minutes before serving. Brown sugar enriched gluten free sponge cake layers joined together by sweet fresh strawberries and clouds of vanilla whipped cream. This is a treat perfect for welcoming warmer days. I remember making many sponge cakes with my Dad when I was a little girl. Baking with Dad was one of Jessica and my favourite ways to spend a Saturday morning. We would climb up on chairs at the kitchen bench and pull down Dad’s old Navy cookbook: a maroon leather volume entitled ‘Australian and New Zealand Cookery’. We flipped past all the savoury pages until we found the sweets and baking section. This was an early sign of what was to come for Jess and I. Together with Dad we wandered all over the baking world: melting moments, jam drops, chocolate eclairs, marshmallows – and sponge cake. Through our Saturday baking mornings together Dad taught us so many fundamentals for our future endeavours in the kitchen, but more than that, he baked up memories with us that lasted long after the last crumbs vanished. This is one of the reasons that baking equals love in my family. Because baking takes time, and taking time to make something for someone you care about is an expression of love. 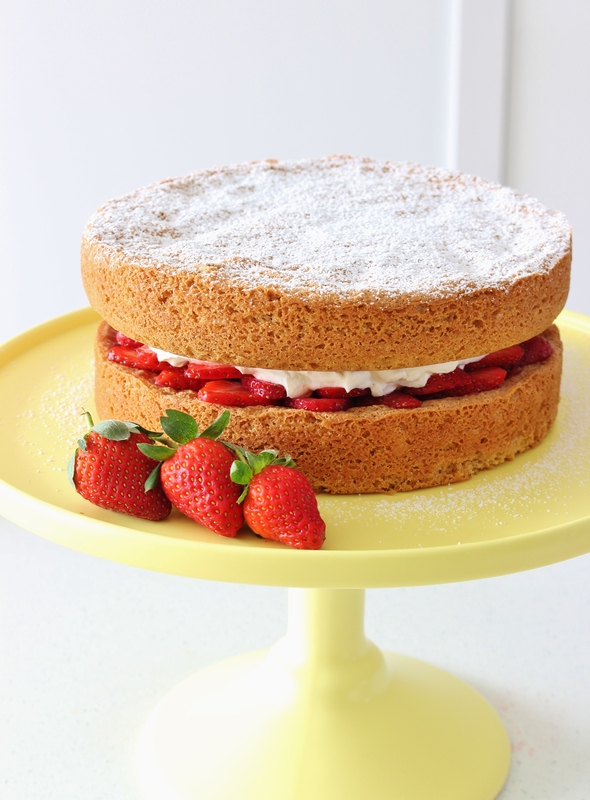 This Father’s Day I wanted to recapture the spirit of some of our Saturday baking sessions, and I knew I had to recreate a gluten free version of sponge cake, with an Amy twist. This sponge is just as light and airy as those made long ago, but there is a hint of caramel in the background because this recipe replaces caster sugar with brown sugar. 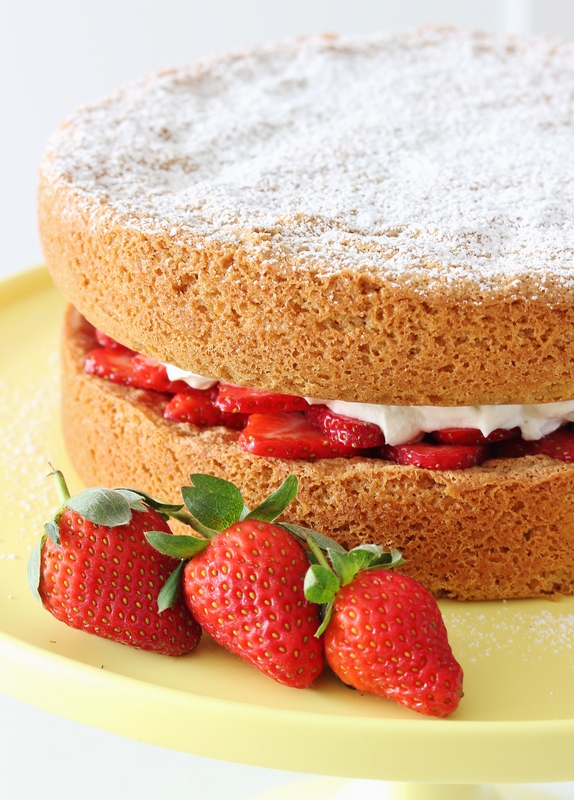 This is not a sponge that is merely a vehicle for cream and berries, but a cake that holds its own. 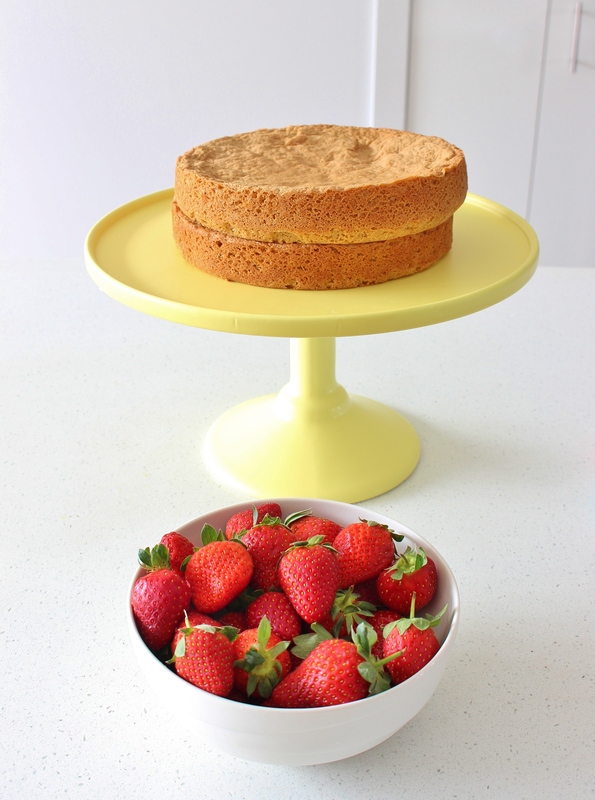 Layered together with vanilla sweetened whipped cream and fresh strawberries, this cake evoked memories, and was the perfect way to celebrate my sweet Dad. Make sure your eggs are at room temperature. This will ensure the maximum volume is achieved when you whip them with the sugar. More volume = lighter sponge. Be prepared before you start: preheat the oven; measure out your ingredients; and grease and line your baking tins. Yes. You really do need to sift your dry ingredients three times. When folding use an under and over swooping motion and turn the bowl a quarter turn after each fold. Make sure you scrape the bottom too. Be very careful when you are rotating the cakes and opening/closing the oven door. You do not want to bash all the air out of the cakes. Remove your sponges immediately from the tins once they are out of the oven. And allow to cool completely before filling and decorating. The more cream, the better. We spent Sunday morning sitting on the patio of Jess and Trent’s house, celebrating Dad and enjoying the fresh spring morning. Slices of fluffy brown sugar sponge with mountains of sweet berries and whipped cream were passed around, plates were scraped and seconds were sneaked (that might have been me…). Recreate this family classic for your loved ones, and conjure up memories of teatimes past. 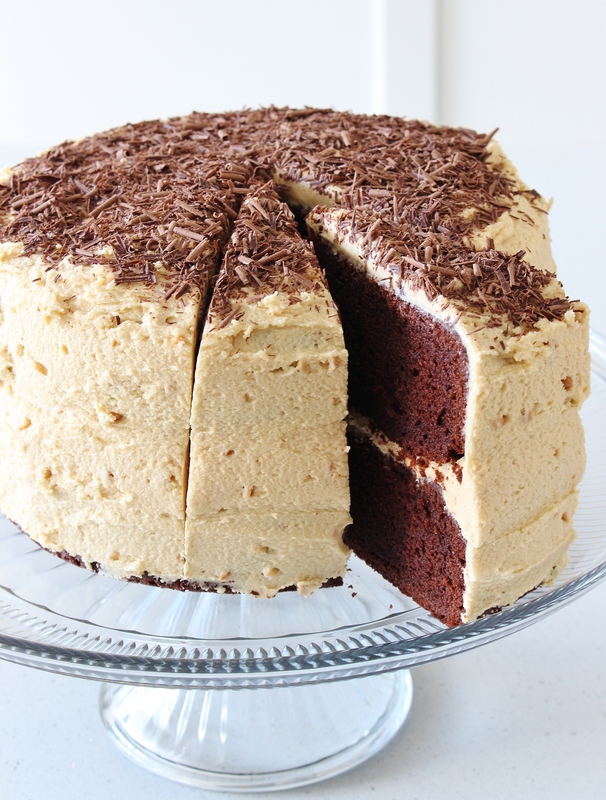 Gluten Free | Serves 8-10 | Best eaten on the day it is made. Leftovers will keep up to two days in the refrigerator | Adapted from here. Preheat your oven to 180C (350F or 160C/320F if fan-forced) Grease two 8-inch round cake tins. Line the bottoms with baking paper. Place eggs and brown sugar in the bowl of a standmixer fitted with the whisk attachment and whisk on high for 10 minutes or until thick and creamy. You could use a large bowl and a handheld mixer instead if preferred. Sift together white rice flour, sorghum flour, cream of tartar and baking soda three times. Once the eggs are finished beating, sift dry ingredients over the top and then very gently fold into the batter. Use an under and over motion and be sure to scrape the bottom. Divide batter between pans and bake for 15-18 minutes. Swap pan positions halfway through baking time. Once the cakes are finished cooking, remove from the oven and immediately turn out onto a wire rack to cool. Once the cakes are completely cool you are ready to assemble them. Start by whipping the cream together with the icing sugar and vanilla. 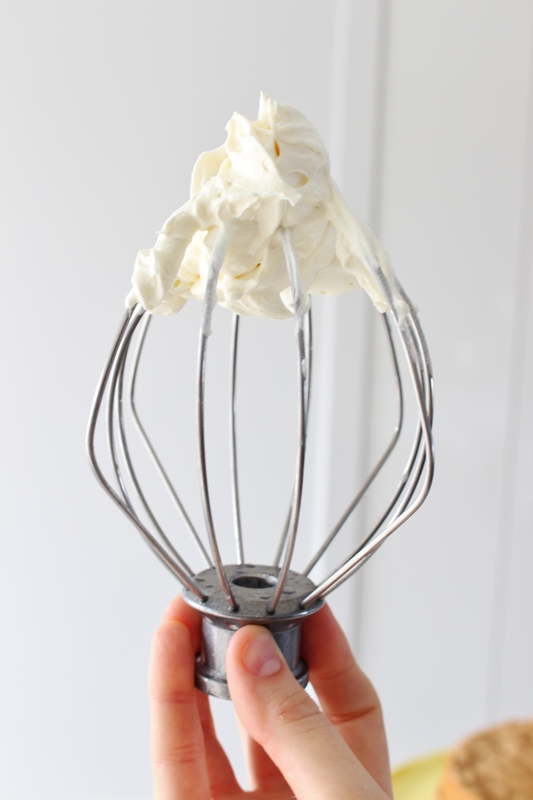 Use a standmixer fitted with the whisk attachment and whisk on high until you achieve stiff peaks. 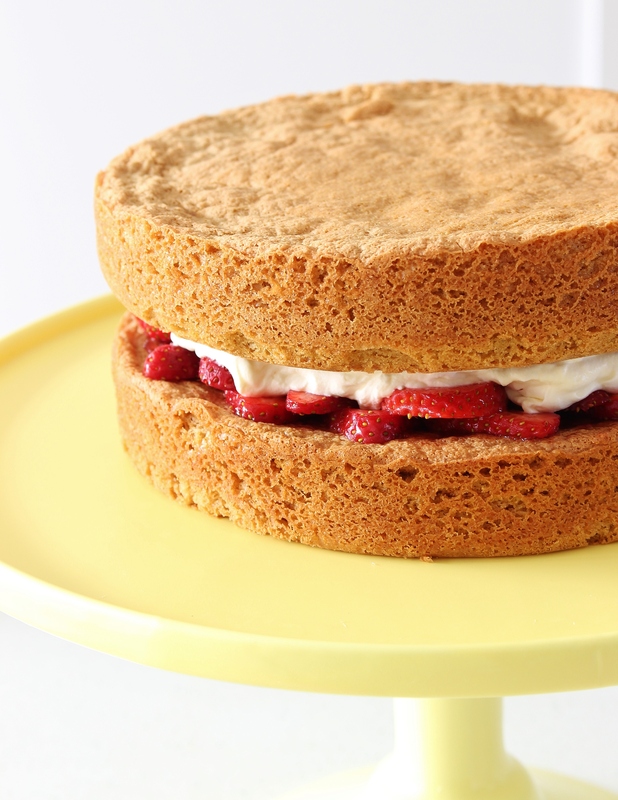 Place one layer of cake down onto the serving platter and spread with the strawberry jam. 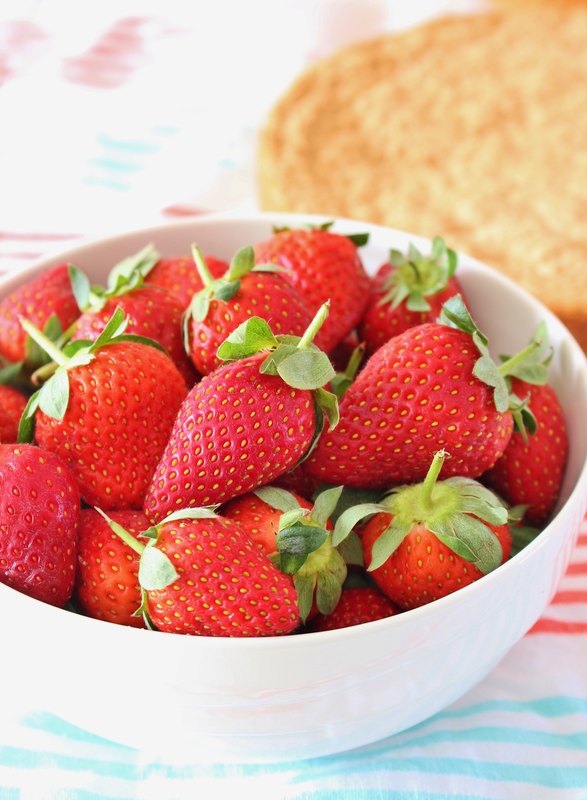 Slice strawberries into pieces and layer these onto the cake. 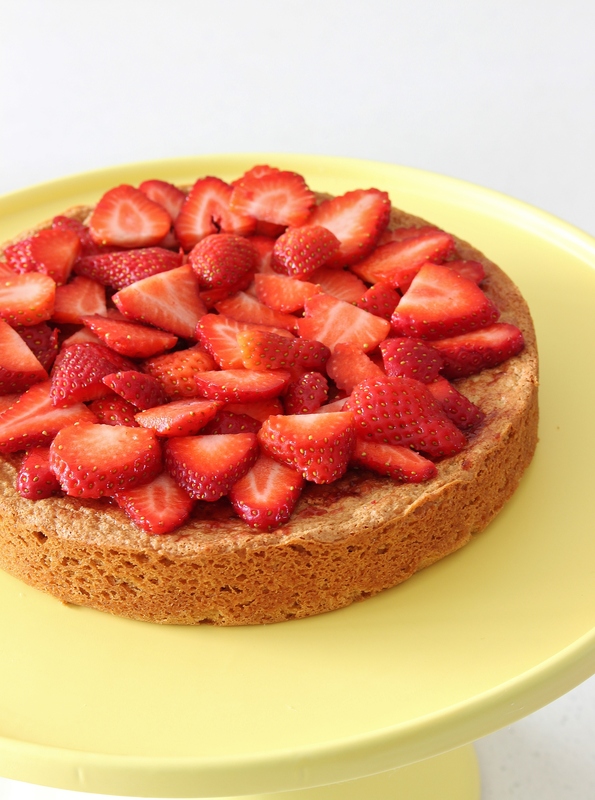 Spread cream over strawberries and place second layer of cake on top. Dust with extra icing sugar if desired and serve with more strawberries.